Are you looking for fun ways to get your Facebook fans engaged? Wondering how other pages are developing their posts to increase likes, shares and comments? People love to see their content and their friends’ content shared by brands. Use your fans’ content instead of your own to give your post a viral push through specific communities that are close to the content creator. 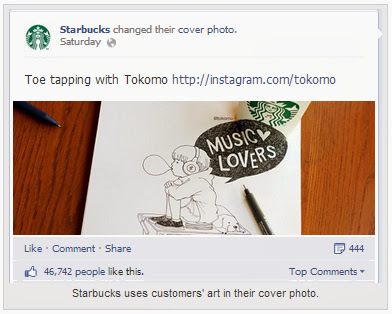 Starbucks showcased a talented customer’s drawing as their cover photo, then provided a shout-out to this dedicated customer by including a link to the artist’s Instagram profile in the image description. Every few weeks, Walmart creates a new seasonal cover image with photos of real people from their fan base. Every customer wants to be heard and questions let them use their voice in the form of comments. Ask your fans to share about consumer preferences, help you name a product or describe memories and moments associated with your brand. When Skittles asked fans to describe the moment they opened a pack of the candy, the post received over 5,000 interactions. Relate questions to specific consumer lifestyles, such as where or how they use your product. 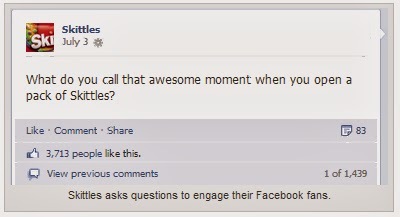 Monitor your customer feedback on Facebook posts and comments, Twitter mentions and emails to find question topic ideas. You Voted: Handmade or Factory-Made Products?